Urged forward by her adoring fans, the host nation’s Adriana Diaz booked her place in the final of the women’s event at the Universal 2019 Pan America Cup in Guaynabo, Puerto Rico by emerging successful on the early afternoon of Sunday 3rd February in the penultimate. The no.2 seed, she beat Wu Yue of the United States, the no.3 seed in a full distance seven games encounter (11-8, 11-3, 7-11, 7-11, 11-3, 5-11, 11-4); the contest being in sharp contrast to the immediately preceding penultimate round engagement, which had witnessed a straight games success for Canada’s Zhang Mo, the top seed, in opposition to Brazil’s Bruna Takahashi, the no.4 seed (11-8, 11-4, 11-5, 11-5). Success for Adriana Diaz and Zhang Mo means they have qualified to compete in the ITTF Women’s World Cup to be held later in the year in Chengdu, China; however, the Puerto Rican teenager kept the crowd on the very edges of their seats. The match was very much a reflection of their most recent meeting, the women’s singles final at the 2017 Pan American Championships in Cartagena de Indias. On that occasion Adriana had also won in seven games, having earlier in tournament experienced a four games reverse against the American in the women’s team competition. Hard fought from Adriana Diaz, earlier to start the day it had been clinical from Zhang Mo who maintained her ascendancy against Bruna Takahashi. 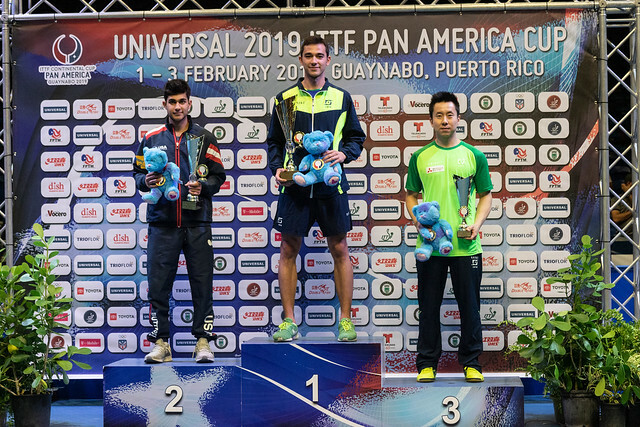 In 2018 they had met at same stage of the Pan America Cup as well as at the Pan American Championships and on the Seamaster ITTF World Tour in Austria. On all three occasions Zhang Mo had prevailed. The final and third place matches will played later in the day.